The colorful spreadable wonder of coffee filter art is hardly breaking news. If you talk to 10 early childhood educators, it’s likely that 9 (if not all 10) have tried this science + art experiment. That said, tinkering with the basic idea is a concept that intrigues me. 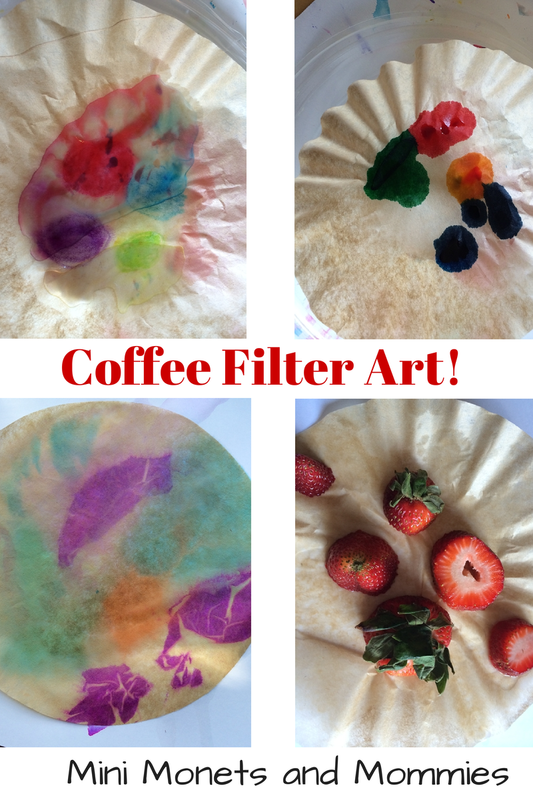 As if asking your child “What do you think will happen to the color?” isn’t educational enough why not add a bonus step and try different ways of coloring the coffee filter? Tempera paint- Love the stuff, but it was way too thick to do much. I probably should have brushed on less, but in any case – I don’t think that this ideal for coffee filter art. The tempera paint didn't spread much. Food coloring- When working with kids, this is what I usually use for this project (or water color paints with the same consistency). They spread like a dream and create a tie-dye style design. This coffee filter looks like a tie-dye. Tissue paper- I’m a little obsessed with non-colorfast tissue paper. I’ve made rain prints with it, colored Model Magic with it and even made an Earth model using it to create ocean and continent colors with it. You absolutely cannot use colorfast or non-bleeding tissue. It won’t work. You also should stay away from pastels. The vibrant hues work better. ﻿I tore up the tissue and put it on the filter before adding water. Worked like a charm. Plus it came out with a pretty print! Markers- I got the idea that these writing tools could work like paints from a super-creative post on Happy Hooligans that details how to make your own water colors out of dried up markers. So, I started with a washable markers (because the color will run), and drew a few circles. After adding water, the color ran and created a delicate design. The only drawback is – too much water and the color fades away. Strawberries- I have a thing about using food for art that you aren’t going to eat. But, I also dropped half a pack of strawberries on the floor (mere feet away from where the dog had just had an accident minutes before – I had cleaned it, but still…). There was no way that I was washing the berries off and eating them. I cut them apart, pressed them into the filter to release the juice and let the water run. The result was a pretty pink color. The verdict: Food colors were the easiest, brightest and (in my opinion) best for this art activity. The tissue paper came in a close second. The color wasn’t as bright, but it’s a different way to spread the color onto the filters and it creates interesting patterns. Are you a fan of coffee filter art? Leave a comment about what technique your kids like best. Looking for more art and science activities for kids? Follow my Pinterest board for ideas! I just popped by to say g'day from the blog hop; I'm already following you on G+ and Twitter! Please stop by and say g'day if you have a minute! Thanks so much for sharing with the #pinitparty. Have pinned. Fine arts expand the boundaries of learning for good essay the students and encourage creative thinking and a deeper understanding of the core subjects.! The most common filter used in households today is the paper filter. This is a no mess way of making coffee. Just lift the paper filter out along with the coffee grinds and dispose of it. I think the paper filter might be the most commonly one used nowadays. It's ease of use makes it the best and the most logical one to use.What Kind of Coffee Do You Use in a Percolator? This is such a nice that having a coffee maker at home, so anyone can make it easily as it is very easy to use, very userfriendly and I will definitely go for one so I my husband can also bring a coffee mug filled with full of coffee for me. You can see more varieties of coffee maker here.